Ulster Superbike champion Gerard Kinghan has joined the IFS Racing team for 2019 and will ride a Yamaha R1M. Randalstown’s Gerard Kinghan expects to have a tough fight on his hands to retain his Ulster Superbike title in 2019. The new season gets underway on Saturday at Bishopscourt in Co. Down, where Kinghan will make his race debut on the IFS Yamaha R1. He rode the machine for the first time last Tuesday during a track day at Kirkistown, although he was unable to really push the limits of the 1000cc R1 due to the cold temperatures. His opposition includes Dromara’s Alistair Kirk on the AKR McCurry Racing BMW, J McC Roofing riders Carl Phillips (Kawasaki) and Ryan Gibson (Suzuki) and the returning Nico Mawhinney, who is back in action this season on the Team Polaris Kawasaki. Kinghan said: “It’s a new bike to me and we I rode it for the first time last Tuesday at a track day at Kirkistown. “I didn’t really get the chance to ride the bike in anger because it was so cold and the track temperature was about eight degrees. “I didn’t want to push too hard and do anything stupid first time out, but hopefully on Saturday the temperature will be a bit higher and we can have a go,” he added. “The Yamaha is very different to the Kawasaki, which for me was like pulling on an old pair of boots because it fitted me perfectly, but it’s definitely a very good motorbike. The reigning champion is aiming to retain his title this season but Kinghan knows he will face a stern challenge. “Ali Kirk pushed me last year and we had some tight races, so it’s not going to be easy,” he said. “Carl Phillips and Nico Mawhinney are back and Ryan Gibson has been improving, so we’re going to have to work hard. “But I joined IFS Racing to win the title again and they have so much experience with the Yamaha. It’s a long year so we’ll just try and keep building as we go along and get faster. Rising young prospect Eunan McGlinchey is entered in the Supersport class on the Team 109 Kawasaki as he prepares to make his debut in the British Superstock 600 Championship this year after winning the Junior Supersport title in 2018. McGlinchey impressed during the British Superbike Support classes test on Thursday at Silverstone, setting the fourth fastest time in the Pirelli National Superstock 600 class. Korie McGreevy topped the combined time sheets from Aaron Clifford and Storm Stacey. The Supersport line-up at Bishopscourt also includes Clifford, Mark Conlin, Simon Reid, Joseph Loughlin, Mark Hanna, Darryl Tweed and Jordan McCord. 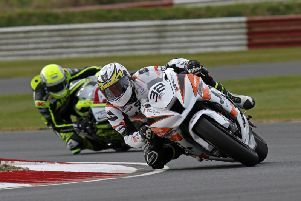 Road racer Paul Jordan will also compete at Bishopscourt on his own Yamaha R6. Jordan has joined the Dafabet Devitt Kawasaki team for 2019 and also part in yesterday’s test at Silverstone as he builds towards the Cookstown 100 next month. However, Jeremy McWilliams won’t be in action on Ryan Farquhar’s KMR Kawasaki Supertwin. The veteran racer had hoped to test some new parts ahead of the North West 200 but they won’t be available in time. Practice will commence from 9am with the first race at approximately 11.30am. Admission is £10.